The breed was named after clergyman Reveran John Russell. They were used as small game hunting dogs, mainly for the red fox, digging the creatures out of their dens, back in the 1800s. Breeders had pushed more and more on ability, and the standards became much more broad. Unhappy, the JRTAA was changed into the PRTAA. 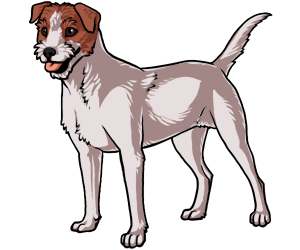 Working types remained as Jack Russells, and the American type was named the Parson Russell Terrier. Jack Russells are also called "Rebel Terriers". Jack Russells actually climb up fences, etc. Jack Russells have hunting insticts stronger than your average terrier.